Rapid improvements in the agricultural scene followed the invention and development of the steam engine and the internal combustion engine. A few decades later it was the arrival of the rubber-tired tractor and the stringing of electrical power lines to the farms. The turning on of power in late October 1950 to the Bruderheim REA lines ushered in an era of developments that surpassed the expectations of all people connected with its production and consumption. 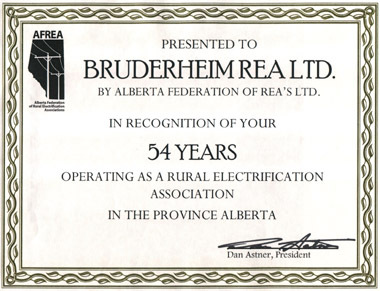 When a group of interested farmers inquired into the feasibility of getting high tension power lines out to the farmsteads, the eventual result was the formation of the Bruderheim Rural Electrification Association. Up to this point in time, a minority of farmers had electric light plants. These would usually consist of a gas engine driven generator and a set of wet batteries providing a direct current of 32 volts. The wind charger was a propeller driven generator and was dependent on the wind for its motive power. The laundry could be done on days when the wind was blowing. It was a source of very limited power and was chiefly used as a means of lighting. It was this desire for something better that led to the formation of the Bruderheim REA. Enquiries and meetings with officials of Calgary Power and government convinced a group of interested farmers that their desire for high-tension line power was practical. On March 25,1948, a meeting was held by a group of farmers in the old Social Credit Hall. They expressed their desire to form an Association and therefore were duly registered under provisions of the Cooperative Associations Act. The charter board of directors is shown below. William Mallon was Married to Julia Wagner, sister of John Wagner. William was noted as the designer and builder of the windmill which he made entirely from wood, including the gears and the nails. There were no metal parts. The millstones were selected from the North Saskatchewan River, chiseled and ground down by hand. The mill was used by the family to grind their own flour, crush grain for the cattle and cut their own firewood. When the wind blew at an appropriate velocity, this mill could turn out a very acceptable rye flour [about 150lbs per day]. 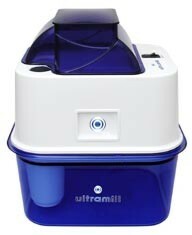 Today, with the flick of a switch or the push of a button, and with one of the many models of small grain mills for household use available that weigh from nine to about 50 lbs and are driven by electric motors that consume from 300Wh to 1.25kWh, a comparable and even far larger output of flour can be achieved with far less effort and far less investment in time, attention and money. An example of such a mill is shown in the photo at right. 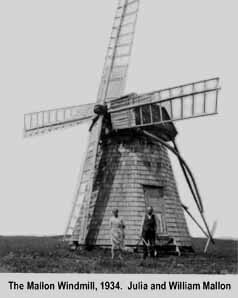 Mind you, it will not likely happen, if ever, that the modern grain mills will evoke as much interest and nostalgia as mills such as the Bruderheim Windmill do. 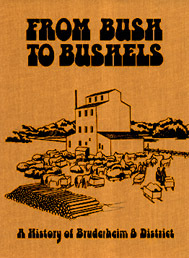 It appears that when it took hard work and ingenuity by many individuals to achieve things for many, the efforts of those individuals were and still are much more appreciated than the output of mass-produced machines, even though the designing of those machines and the designing and manufacturing of the tools and machines required to produce them requires far greater ingenuity and skills by far greater numbers of men than did their medieval prototypes. Regardless of how much those machines were improved over the years, they, their prototypes and even the electricity used to drive them now were originally and are still now successfully used to make life for women easier. That is one of the reasons why women appreciate men and are grateful to them, men such as the founders of the Bruderheim REA whose hard work brought electric services to the rural area around Bruderheim. The work of canvassing the area farmers for membership now started in earnest, so that plans for construction could be drawn up. Easements for right-of-way had to be obtained. Brushing crews had to do clearing so that the survey scheduled for November 15, 1949 could get underway. This was a new adventure not only for the farmers but equally so for Calgary Power which was to be the supplier of electricity. No one had any experience which would have provided some guidance for a project that was truly a pioneering venture. The farmers did as much of the actual construction work as possible in order to save costs. With an estimated cost of $830 per member, 64 contracts were signed. That was based on an average of 5/8 mile of line required per member. Extra footage would be charged for members living beyond this distance. Loans from chartered banks were available for farmers who could not afford the total cost immediately. These required a $200 down payment with the balance payable over a 5-year period at 3 1/2% interest. Mr. Oberholtzer, the Deputy Minister for the Department of Trade and Industry assured the Association that the government would underwrite 1/3 of the total cost. Some farmers would not sign easements and the matter had to be referred to the M.D. of Lamont. In May 1950, a master contract was signed with Farm Electric Services. This was a subsidiary company set up by Calgary Power to administer and service rural association consumers. In June, construction commenced with Ken Goodwin, the project engineer in charge. Calgary Power brought in their digger which was used to dig holes. The farmers themselves supplied labour crews for aligning of poles, tamping, installing pole insulators, brushing, mending of fences and whatever other work was required. The Association had set their rate of pay at $1 per hour. Mr. Anderson of Farm Electric Services informed the board that that rate of pay was too high since their rate was only 75¢ per hour at the time. The board nevertheless remained with their rate. In just a few summer months, the construction of the lines was completed. Farm Electric's crew strung the wires and set the transformers. There was also a flurry of activity to get farm homes and barns wired, in readiness for the day when electricity would flow through the lines. To celebrate the turning on of power, a banquet for members and their wives was discussed. However, there was no facility available that could accommodate such a large number of people. Therefore, the idea had to be discarded. In August 1952, after two years of operation the membership realized a $110 refund on their original construction contract. The advent of electrical power on the farm brought about an entirely new way of life to the old homestead. Electricity is used in ever more labour-saving applications.